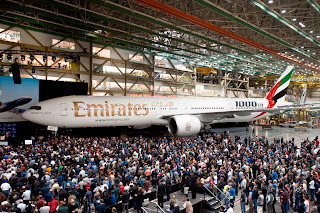 DUBAI - March 3, 2012 – Emirates, one of the world’s fastest growing airlines, today celebrated the unveiling of the 1,000th Boeing 777 during a special event at the manufacturer’s plant in Everett, Washington State. Emirates is the world’s largest operator of the Boeing 777 and the landmark aircraft will become the 102nd to join the airline’s 777 fleet when it is delivered later this month. The factory celebration was attended by more than 5,000 Boeing employees, suppliers and government officials, including His Highness (H.H.) Sheikh Ahmed bin Saeed Al-Maktoum, Chairman and Chief Executive, Emirates Airline & Group, a delegation of dignitaries from the UAE and senior Emirates executives. 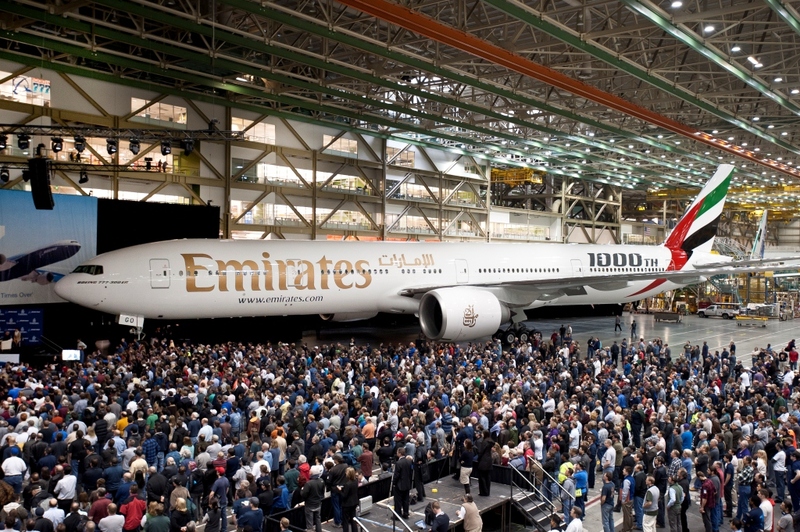 “It is very fitting that Emirates is the recipient of our milestone 1000th 777 delivery. Emirates has set an industry high bar in providing excellent customer service and we are honoured that the 777 is central to its efforts to be a global airline leader,” said Jim Albaugh, president and CEO of Boeing Commercial Airplanes.